Door County Walleye Fishing offers the fisherman one of the best opportunities at catching that true monster trophy walleye of a lifetime. 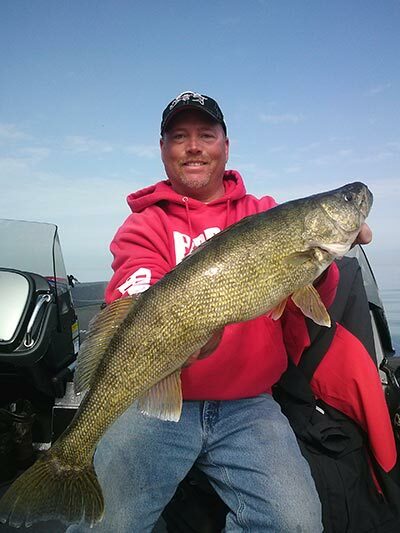 The waters off Door County have produced some of the largest walleyes caught anywhere around the state for many years. Door County is a true trophy destination when it comes to catching giant walleyes. Shortly after ice out Door County walleye fishing in open water will begin to take place in and around the areas where the walleyes will spawn at. Here is where we will begin to fish for these fish using two different techniques one technique would be to cast jigs and soft plastics the other technique that works well for us is trolling minnow baits along the shorelines both during the day and at night. During the summer months and into early Fall the Walleyes will begin to relate to open water and mid lake structure areas where you can find great opportunities at catching Door County walleyes trolling both crank baits along with spinner rigs with night crawlers behind planer boards.